This is a recipe from “Cooks Illustrated” dating back over 20 years. They’re my go-to autumn cookie. I’ll make these before chocolate chip, or oatmeal. They are flavorful without being overly sweet. Tender without being cloying. You can double the recipe, it’ll still fit in a standard Kitchen-Aid mixer bowl. The dough also freezes well. Shape the cookies into balls before freezing and you can thaw and bake a few at a time. Center a rack in the oven and preheat to 375. Line two baking sheets with parchment (or Silpat sheet liners). Put 1/2 cup sugar and 1/4 tsp salt in a wide, shallow bowl for rolling. In a large bowl, whisk together flour, baking soda, spices and salt, set aside. In a stand mixer, beat butter until fluffy. Gradually add brown and white sugars, beat until incorporated. Reduce speed to medium, add egg yolk and vanilla. Beat until incorporated. Reduce speed to medium low, add molasses and beat until incorporated, pausing to scrape down sides. add flour/spice mixture, beat on lowest setting until incorporated, roughly 30 seconds. Scrape the sides of the bowl as needed. 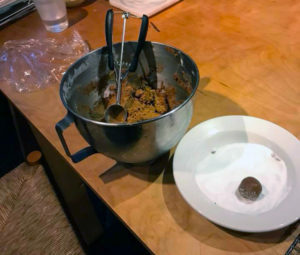 Using a small ice cream scoop or tablespoon measure, scoop a heaping tablespoon of dough. Roll between your palms into a 1-1/2″ ball. Drop ball in rolling sugar, roll to coat, and set on a baking sheet. Repeat with remaining dough , spacing the balls 2″ apart. (Note: if you want to freeze these, roll them, don’t sugar them, bag them and freeze them at this point). 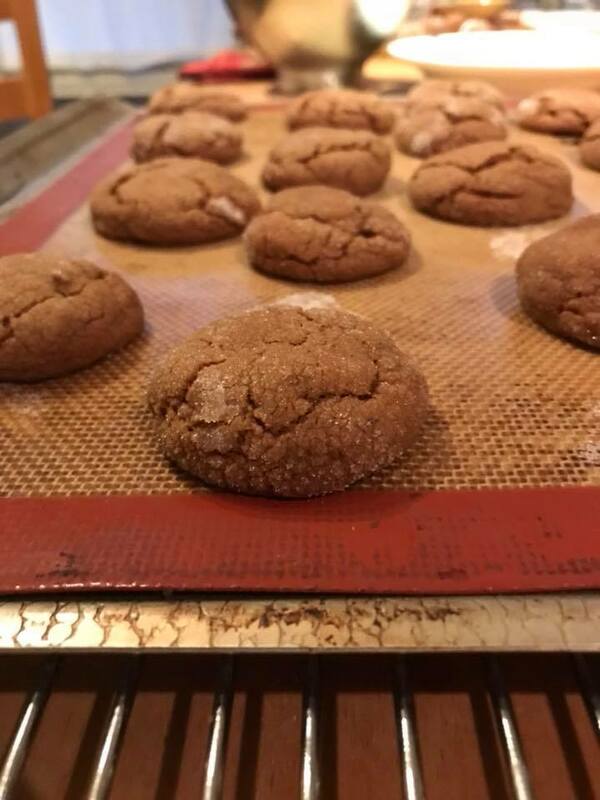 Bake one sheet at a time, until the cookies are set on the edges, but still look slightly puffy in the centers (this will keep them tender and chewy), approximately 11 minutes, rotating the baking sheet halfway through cooking to ensure even baking. Transfer cookie sheet to a cooling rack, let the cookies rest for five minutes or so, then transfer the cookies to a wire rack to cool completely. Makes approximately 24 cookies.